Cthulhu is a fictional deity created by the horror writer H. P. Lovecraft. Cthulhu is a powerful monster from another planet. It (Cthulhu is neither male nor female) is very ancient compared to humans, being around since the dinosaurs. It has the alien appearance of a large green dragon with the head of a octopus and human-like hands. There are said to be many people who worship it as their deity because of his powers over the mind. 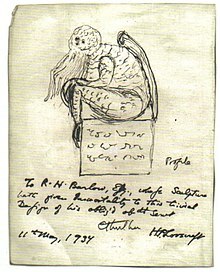 In one of Lovecraft's stories, The Call of Cthulhu, he said that Cthulhu currently lies in a dreamlike state in the underwater sunken city of R'lyeh (rill-ee-yeh), waiting for the time when the Old Ones shall rise again. In the story, R'lyeh is located in the southern Pacific Ocean. This page was last changed on 27 September 2018, at 19:44.